One popular travel website has over 1000 hotels listed in London, with 322 of them in the luxury category. It’s difficult to know where to begin your search…by number of stars, location, price point, or perhaps more specific requirements such as on-site gym or a decent on-site restaurant. After an absolutely perfect stay at One Aldwych (and I don’t say that lightly) where my every creature comfort was met and often surpassed, I wholeheartedly suggest you save yourself from tedious research and simply go online immediately and book a room, any room. However, for a real treat, try and reserve Suite 410, which has a large circular room overlooking the River Thames and a private gym. Or maybe you’d rather Suite 500, also with its own gym plus you’ll have stunning views from your private roof terrace. One Aldwych is in a historic building constructed in 1907 for The Morning Post newspaper. It is located in bustling Covent Garden, London’s sweet spot, with no end of theaters, boutiques, galleries and restaurants just a short walk away. From the minute we were warmly greeted at the front desk by Isabella and Spencer the dog, we received stellar service from everyone we encountered. When I called because our room was too warm, I had barely hung up the phone before there was an engineer knocking on the door, who not only fixed the air-con but also sweetly showed me how to connect to the complimentary Wi-Fi on both my phone and iPad. The standard rooms are not enormous but are exceedingly comfy and thoughtfully laid out, particularly for a girlfriend getaway. We loved the bathroom- complete with double sinks, power shower, natural bath products from PlanTation, mist free mirrors and a mini-TV. They even include a clear plastic zip-bag for your carry-on toiletries when you leave, and how civilized to have fresh flowers, fruit and a newspaper delivered daily, as well as complimentary shoe shining. Plus, this is the first time I’ve been in a hotel that as a hidden safe (shhhhh-look behind the painting). Probably one of the most welcoming hotel bars I’ve ever encountered, with super high ceilings, gargantuan windows, dramatic flower arrangements, bright colors, jazzy artwork… a look that many other design hotels strive to get right, One Aldwych seems to achieve naturally. It’s no wonder that it was named one of the top five hotel bars in the world by The Sunday Telegraph. Whether you stop in for high tea, cocktail hour or a nightcap, the place is buzzing. Next time I think I’ll rent a kid to join me for their scrumdiddlyumptious Afternoon Tea inspired by Charlie & The Chocolate Factory. Treats include an adorable selection of cotton candy, rainbow colored puds and lollipops. Far from being just a hotel accommodation, Axis is truly a destination restaurant. 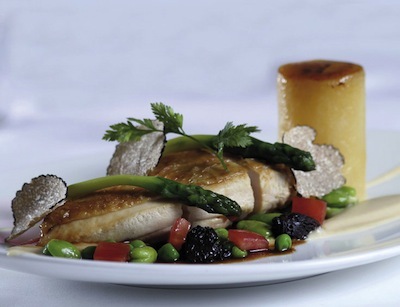 Executive Chef Dominic Teague’s is the poster child for Modern British cooking. His impeccably presented food bursts with bright, clean flavors, allowing the finest local ingredients (including foraged foods and a tempting line-up of artisanal cheeses) to shine in their own right. Highlights include Roast Orkney scallops with a sea purslane terrine, and a simple but sublime Pot-roasted Cotswold chicken with the lightest herb jus. Almost any dessert on the menu is a winner but if I had to pick one, even though I’m not a big chocoholic, the chocolate and caramel tart with buttermilk ice cream has it all going on. After three winning wine pairings I say go with any of the sommelier’s recommendations. Loris was one of the most unpretentious somms I’ve encountered and between him and our fabulous server, Michela, they added a huge dollop of joie de vivre to our meal. This fall Axis will be starting another season of Film & Fizz, which sounds fantastic. Sip a glass of champagne, while watching a blockbuster film in the private screening room, followed by a three-course Axis dinner equals the perfect date night! Even if you don’t splurge on a suite with a private gym you have many exercise options here, which made me very happy since I actually indulged in three desserts at Axis! You can start with a work-out at gym (better equipped than the one I belong to at home, plus it’s open 24/7) with a personal trainer if you wish, followed by a few laps in the blue-on-blue, chlorine-free swimming pool, accompanied by soothing underwater music. If you’re a runner, you’ll find a basket of clean towels next to the front door with a card outlining three jogging paths labeled City Route, Green Route or a 6.5 mile Endurance route. Afterwards you can retire to the full-service spa for a steam, sauna or a variety of tempting treatments. Final proof that One Aldwych is special is the fact that it was awarded the Luxury Eco Certification Standard (LECS) in association with The Leading Hotels of the World. It is one of only six hotels to gain this independently assessed accreditation worldwide, and the first in the UK. For special Luxe Beat VIP offers at One Aldwych call 888.212.6444 or go to classictravel.com/luxebeatvip.